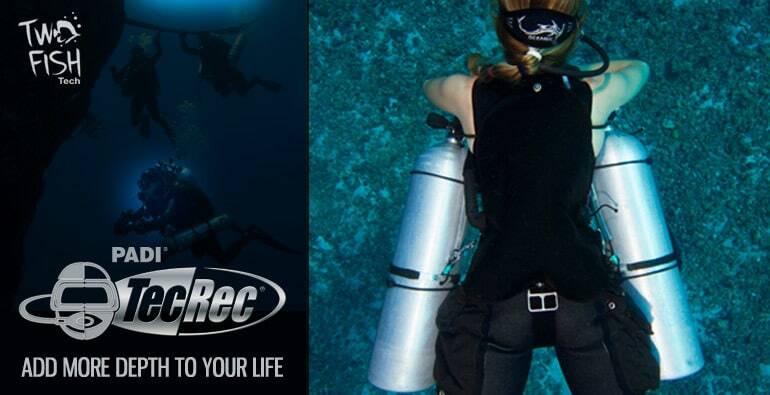 For those who are interested in tec diving and finding out a little more about using a different configuration of equipment, added tanks and of course, looking very cool, then Discover Tec is a good way to do so. 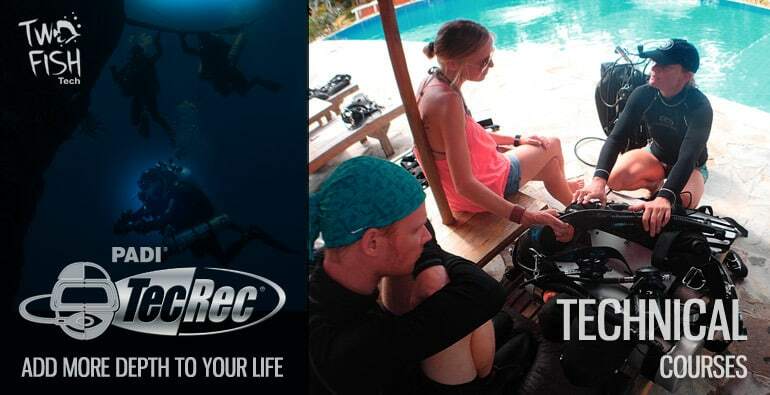 You will learn the basic setup of twin-sets or sidemount cylinders, and you will be introduced to some of the tec skills learnt in the the first tec level course, the PADI Tec 40. 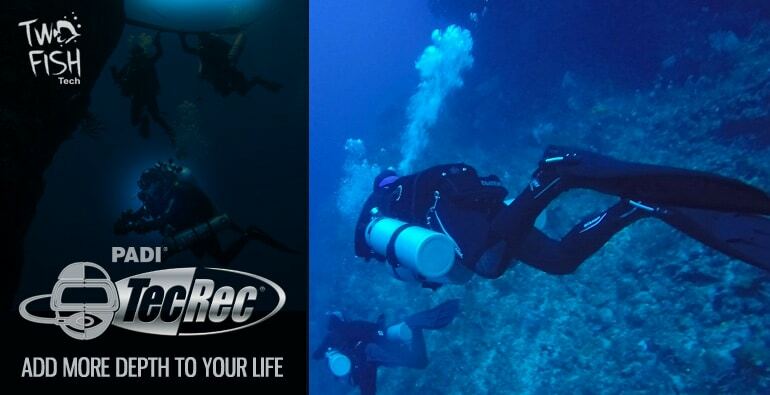 DANGER, PROCEED WITH CAUTION, TEC DIVING IS ADDICTIVE! Tec 40 is the entry point into technical diving, the transition from recreational diving. During the course you will be using the full technical diving equipment configuration of twin banded tanks and carrying up to one stage tank to a maximum depth of 40 meters. During this course you will learn to plan dives accounting for gas requirements, decompression, oxygen exposure and inert gas narcosis using up to EANx50 to conduct dives with up to 10min of decompression; and to have a contingency for when things do not go as planned!  Intro to Tech starts changing your mindset from being a recreational diver, to the analytical planning required for the diver prepared for every “what-if?” scenario. During the course we will work on every aspect of dive planning, and develop your self rescue skills to make full use of the redundant systems used by every modern tech diver. For those who already have some experience diving twinsets, the Advanced Nitrox Course qualifies divers to use enriched air nitrox from EAN 21 through EAN 100 within your current certification level to a maximum depth of 40 metres during dives that do not require staged decompression. Perfect for anyone who wants to go beyond a Discover Tec day but doesn’t have enough time for a full Tec 40 course or does not yet fulfil all of the prerequisites. Tech Basics allows qualified Advanced Open Water divers to learn more about what technical diving is all about before committing to a full course. During two pool sessions and two open water dives, you learn to handle three cylinders, plan dives, calculate gas requirements and much more. Often taught in conjunction with the TDI Decompression Procedures course, this is equivalent to PADI Tec40 and can be considered the foundation of your technical diving career. Advanced Nitrox is also a great course for those wanting to extend their bottom times in shallower depths such as scientific diver, and a must for SCR or CCR divers.